The manager for U.S. jazz singer Patti Austen, meanwhile, said the singer had cancelled a concert in Beijing because of an asthma attack likely linked to pollution. She said her husband went to work in a mask, that he could barely see a few meters ahead of him and that his usual bus had stopped running. No wonder, as I monitor visits to our website, we have been getting visits from browsers based in China. 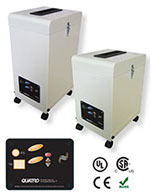 We can ship air filtration systems, air cleaners, air purifiers to China or anywhere else in the world for that matter – will definitely cost much, but we can do it if the end user, buyer wishes to avail themselves of a very well made, well engineered, well designed, well thought off air filtration system – our BreathEasy Home and Office line.